President Trump’s budget proposal doesn’t contain a lot of surprises when it comes to children’s health coverage. We have seen much of it before: the drastic cuts to Medicaid, per capita caps, and repealing the Affordable Care Act (ACA). As our fact sheet details, overall funding for children’s health would experience drastic cuts if this request were enacted. But we have hope that Congress will have the good sense to reject these disastrous proposals and protect children’s health coverage. Two proposed ideas in this budget are particularly troubling, including one that does not require Congressional approval. If this proposal passed through Congress and became law, states would lose federal funding for people who need time to document their citizenship or eligibility status. This is an unnecessary proposal and one that, if approved, would only lower rates of coverage and deny people necessary care. The second proposal would weaken 12-month continuous eligibility for Medicaid and could be enacted without legislative review. Nearly two-thirds of the states (32) currently provide 12-month continuous eligibility for children in Medicaid and/or CHIP. Continuous eligibility promotes stable access to care by reducing “churn,” or individuals moving on and off coverage due to modest, and often temporary, changes in circumstances such as overtime or extra seasonal work. Continuous eligibility also facilitates a more accurate assessment of the quality of health care children receive in Medicaid and CHIP because most quality measures require minimum periods of enrollment. Currently, all states are required to renew coverage every 12 months for children, pregnant women, parents and expansion adults. However, during that 12-month period, individuals may lose coverage if they experience a change in circumstance that makes them ineligible, such as increased income. For children, states can opt to provide 12-month continuous eligibility, which allows a child to remain enrolled for a full year unless the child ages out of coverage, moves out of state, voluntarily withdraws, or does not make required premium payments. 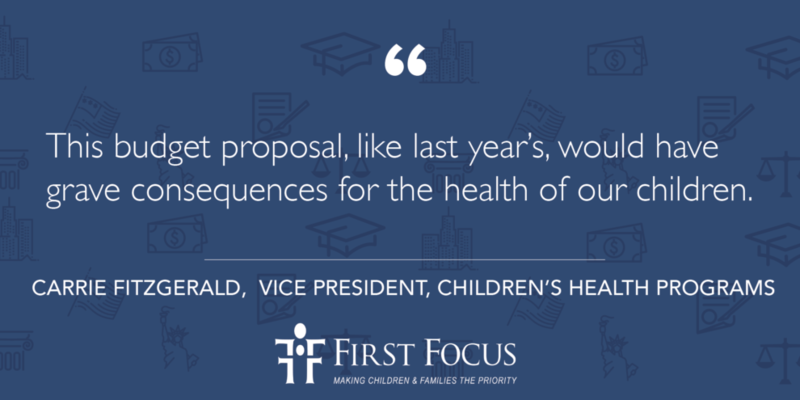 At First Focus, we have advocated for a legislative proposal to cover children continuously for the first five years of their lives, from birth through age five. Twelve-month continuous eligibility is a great precursor to that idea and the majority of states agree. To go back on that progress would roll back the great strides we’ve made in covering children over the last few decades. The items flagged above should offer enough cause for alarm. But other areas of concern in this budget include flat funding or drastic cuts that could affect a wide range of children’s health issues. The proposal goes after the CDC’s chronic disease prevention program and asks for a $210 million cut to the Institute of Child Health and Human Development at NIH. The few funding increases it does include are modest and do not offset the cuts in other areas. For example, the budget grants $50 million to the National Cancer Institute for a new Pediatric Cancer Initiative, but cuts the Institute’s overall budget by $897 million. Overall, the budget’s requested 12 percent cut to the HHS funding paints a grim picture for the administration’s spending priorities on children’s health. This budget proposal, like last year’s, would have grave consequences for the health of our children.